LARRY DOYLE IS NOTHING IF not a numbers guy. 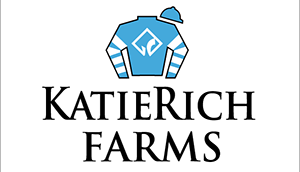 So when the former Wall Street stockbroker and money manager looks over the results from last year’s Keeneland September yearling sale, he takes a measure of assurance and pride that his plans for his KatieRich Farms are coming to fruition. Among the leading consignors by average, there is KatieRich, named for his and wife Karen’s two children, having sold nine yearlings for an average of $204,556. Those graduates, now 2-year-olds and in the care of trainers such as Shug McGaughey and Bob Baffert, seem poised, along with KatieRich graduates from previous sales, to make a name not only for themselves but for the Doyles’ operation near Midway, Ky., which is on track to burst forward after being conceived just a decade ago. A native of Long Island, Larry Doyle in his formative years hitchhiked to Belmont Park with an older brother, enhancing his love of numbers through handicapping. Taking his numeric skills to Wall Street, Doyle, now 59, took a job in 1981 with Thomas Mellon Evans, the owner of that year’s dual classic winner Pleasant Colony. Working closely with Evans’ accounting team, Doyle was able to immerse himself in the business aspect of the horse racing industry, and as his career trajectory rose, he took the jump into Thoroughbred ownership. Doyle noted. “In fact, the stock market is like tic-tac-toe compared to the horse business. “You make some money and then you say, ‘Let’s go try our luck in a negative return business and see how we do,’ ” he said with a laugh. Doyle has managed to keep a positive attitude, though, buffered by the fact that John Malone, whose Liberty Media stock Doyle has been invested in for more than 30 years, has made a huge investment in Thoroughbreds with his purchase of Bridlewood Farm near Ocala, Fla.
Doyle began in racehorses in 2000 when he purchased the Carson City filly Miss City Halo at Keeneland September and the Clever Trick filly Miss Mary Apples for $37,000 a year later. Miss Halo City won the Martha Washington Stakes at 3, and Miss Mary Apples showed promise when second in the Schuylerville Stakes (G2) at 2. Hampered by a breathing problem, Miss Mary Apples placed in four other stakes and ran up $171,172 in earnings. Both Miss City Halo and Miss Mary Apples remain in the KatieRich broodmare band today, with Miss Mary Apples enjoying success when her first foal, Miss Red Delicious (by Empire Maker), became a two-time stakes winner of more than $200,000 and her Pure Prize filly, Dr. Diamonds Prize, a stakes winner of more than $240,000. Doyle boarded his mares at an outside farm during his early years in the breeding end of the industry, and in 2007 he and Karen decided to search for a small farm to call their own. The timing didn’t seem to work in their favor initially, but all’s well that ends well. In the teeth of a strong real estate market, there wasn’t a lot of inventory, so they bought a 330-acre cattle farm on Leestown Road, considerably more land than they had in mind. The financial crisis that became known as the Great Recession came along a year later, putting farms for sale wherever one looked. However, the Doyles ended up quite pleased with their parcel, which they converted into a showplace farm under the direction of president, head trainer, and any other title that comes along Mark Hubley, and the construction expertise of Robert “Elmo” Richardson, a mason who oversaw construction of the barns and roads on the KatieRich property. Key positions at the farm today are filled by manager Tammy Ingebritson and foremen David Ramirez and Orlin Baires. Hubley began breaking horses at a friend’s farm on Long Island after college and had helped Doyle buy yearlings early on. Best friends with Doyle’s brother Jimmy, Hubley went to the racetrack and trained at Finger Lakes for a spell before becoming a teacher. Larry Doyle brought him back into the world of horses. All that remained was getting horses. the plateau of $400,000 as his “sweet spot” in terms of a return on investment. The $1.5 million went for the Include mare Her Smile in foal to Tapit at Keeneland’s November sale in 2014. Her Smile was a grade 1 winner of the Prioress Stakes at 3. That hefty investment began paying dividends when KatieRich sold the Tapit filly she was carrying, now named Pink Sands, for $625,000 as a yearling. She is being trained by McGaughey and has a fancy look about her. Her Smile has a yearling colt by Tapit and an Empire Maker colt at her side. She’s been bred to Candy Ride. Most of the mares that Doyle buys— and he still buys a couple a year at auction in the $200,000-$400,000 range—are unproven as producers. Doyle and Hubley try to minimize that risk by breeding to powerful stallions. but Doyle has already struck half of the mares off his sell list, so reducing might be trickier in practice than theory. “I guess I’m addicted pretty good right now,” Doyle said without sounding at all sad about it. Tale of Ekati. Enhancing has a yearling filly by Hard Spun, an American Pharoah colt at her side, and has been bred to Lemon Drop Kid. purchase, is just beginning her second career and has unraced 2-year-old Princess Char, a Speightstown filly; a Malibu Moon filly at her side; and has been bred to Ghostzapper. Formal Affair produced a Ghostzapper colt for KatieRich that brought $650,000 at Keeneland last year. Now named America Great, he is also in training with Baffert. Doyle said he does his due diligence after his horses move on to their new owners, making sure to put them in his online stable and keeping up with their trainers and owners to find out their strengths and weaknesses. That way he can better decide whether to repeat a mating or move on. KatieRich is much more than simply a breeding operation. Besides boarding some outside mares, it does sales prep and breaking. The farm has an indoor training track to get yearlings going late in the season. Then, Hubley will take at least a dozen 2-year-olds to Rice Road on the Keeneland grounds in January to break KatieRich horses as well as client horses from as far away as New York and California. If the house horses don’t sell as either yearlings or 2-year-olds, they enter the KatieRich racing stable, where Doyle has imagined they could make a big name for their connections. “I feel if I really want to be a Kentucky hardboot, I have to try and sell a horse twice, and if nobody buys it because it has a crooked knee or something, then it can go on and win the Kentucky Derby, and I will then become a hardboot,” Doyle said with a laugh. agents such as Mike Ryan have bought multiple horses from him. As with his experience on Wall Street, Doyle enjoys the constant learning curve presented by the horse business, which keeps it exciting for him. There are the challenges of the math, the numbers, and the endless variations. And there’s the drive to succeed. Copies of this article are available for purchase HERE.